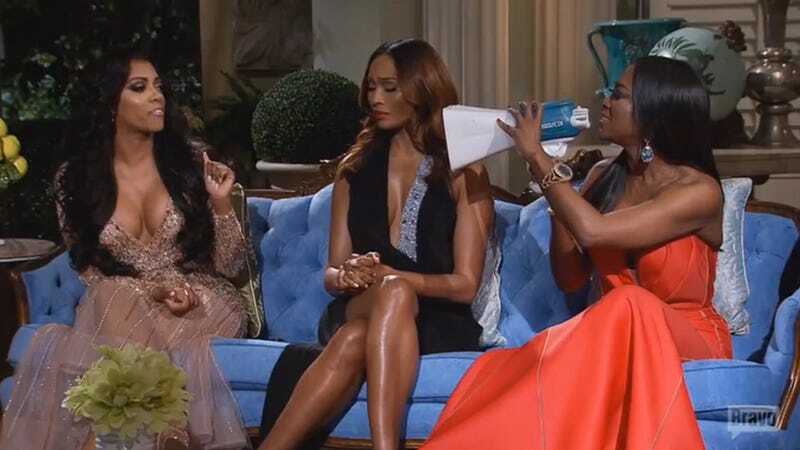 Even if you don't watch Real Housewives of Atlanta, you've probably seen the clip of the fight that happened last night on the reunion special. Two women in evening gowns faced off, there was hair-pulling, both ended up on the floor, and one woman was carried, cradled like a child, off of the set. I don't really know what happened between these people, but I don't need to know: What it all comes down to is women being cruel to other women for sport and entertainment. Obviously the ladies from Atlanta are not the only ones; reality TV is full of woman-against-woman combat packaged as content designed for female viewers. But this particular fight plays into some unfortunate, horrible stereotypes about black women being animalistic, aggressive brawlers. Plus, this country has a history that includes black people beating each other for the fun and profit of white people; in the old days it was mandingo fighting; now it's boxing (of course boxers get paid, but out of their purse come fees for the promoter and manager), or clips like the "Sharkeisha" video, which was viewed more than 12 million times. Black people tearing each other down? America loves it. Can't we do better? Are these women making money in television? Absolutely. But nowhere near as much as producer Andy Cohen. Toward the end of the clip, after pulling Kenya Moore's hair, dragging her down, Porsha Williams cries, "I have embarrassed myself," and it's the right word. She's embarrassed and it's embarrassing and as someone who doesn't even watch, I'm embarrassed that the clip exists. What are we doing. What are we supporting.